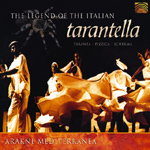 The tarantella is an Italian folk dance, characterised by a fast and lively 6/8 rhythm, often accompanied by tambourines. This album presents the three remaining forms of this ancient musical form: Pizzica-Taranta, Pizzica de core and Pizzica-scherma. Instruments: organetto (small accordion), chitarra battente (guitar), tambourine, violin, vocals. Extensive information and historical notes in English, German, French and Spanish. Stránka vygenerována 22.4.2019 v 23:03:28 za 0.218 sekund.